When thinking about spots I'd consider to be GNR material this place popped into my mind. So I figured I might as well give it's LTH introduction. Maybe come next year at this time it will have some thoughts other than Dolinsky's, Sula's, and my own. All three of us seem to be on the same page with their product. I've read some words of sorrow about one of the Reza's closings but those that are willing to take the ride to Albany Park can get much better than Reza's. As Sula notes in his review from back in June of last year, Kabobi was born out of fraternal discord. The owner here is brother to the owner of Reza's and they had a falling out so he decided to open his own place. I've been frequenting Kabobi since reading Sula's review and always enjoy. It's home to one of the best lunch deals in the city. All of that pictured up above will set you back just $6.95 during lunch ($13.95 / dinner). 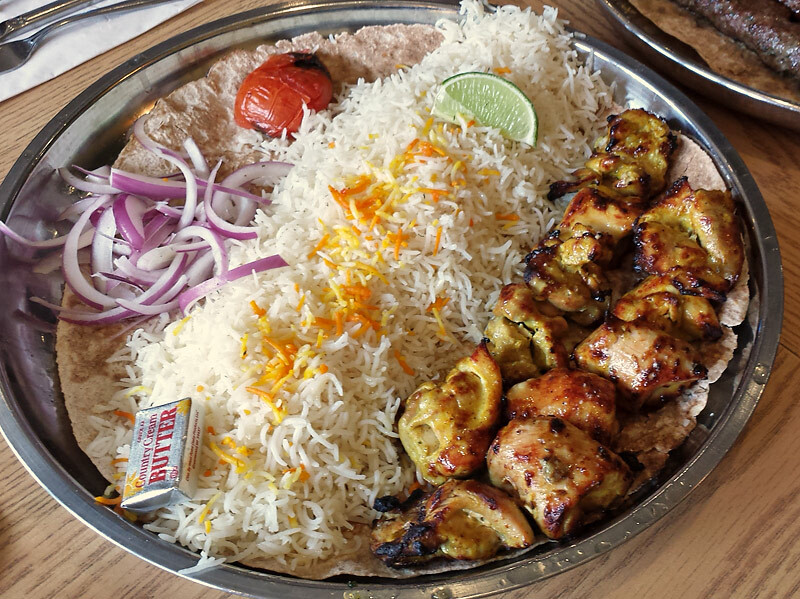 Each plate of grilled meat comes with your choice of fluffy regular Persian or dill rice which in and of itself is enough for a couple lunches. There's also warm pita, charred tomato, onion, salad, and hummus. As the Hound noted the meats are grilled with care and always arrive juicy with good char tang. Pretty much the exact opposite of what I was served at Reza's recently. Quick friendly service and excellent grilled meat plates that most always produce leftovers make this place a regular in my rotation. Da Beef wrote: When thinking about spots I'd consider to be GNR material this place popped into my mind. I would enthusiastically second a nomination! Been going here since Sula wrote about it -- our standard order is the kabob on lavash + kashke bademjan, which is more than enough for two. 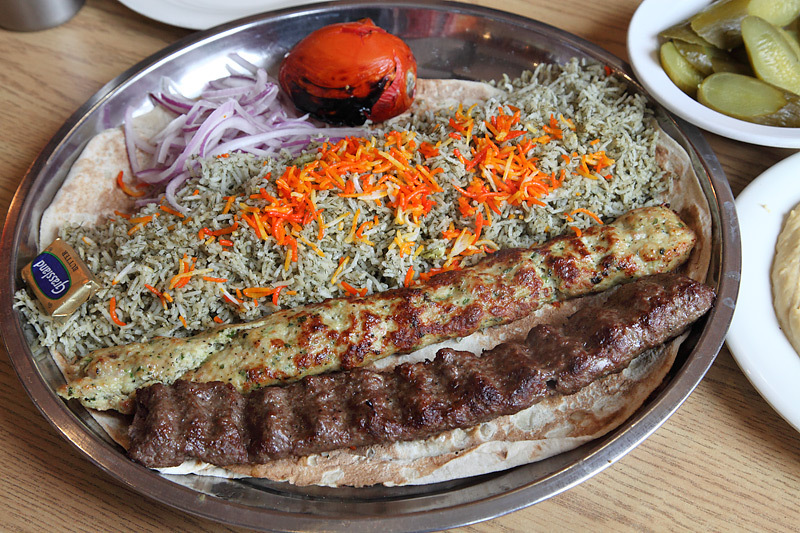 As far as the kabobs, we usually stick to the koubideh -- lamb and chicken -- which are always juicy and very flavorful. Combine that with some very good lavash (their pita is kind of mediocre) and more fresh basil than at a pho joint and you've got yourself something special. I've never seen the place less than packed. Thanks for starting this thread. Looks good, Beef. This has been on my 'need to try' list since Sula wrote about it. For me, it always comes down to how the meats are cooked and the consistency of the cooking. If they're dried out (overcooked), it's just a total bummer. A deal-breaker. Your words and pics are very encouraging. Those meats look juicy and properly cooked. Gotta give this place a shot . . . and soon. 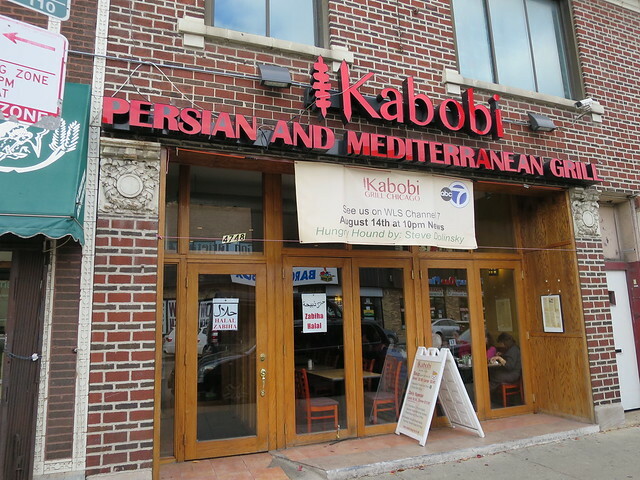 Kabobi is a welcome addition to the already thriving Persian food scene in Albany Park. One of the things that sets them apart is offering both chicken breast kabob OR chicken thighs, here labeled Shish Tawook. Always go with the tawook, which has never failed to bring the juicy goodness; I wish I could say the same for the chicken breast. Lunch here earlier in the week was really nice. Moist, flavorful meats, tender, herbaceous rice, and tasty salads and dips . . .
My favorite of the lot. The chicken was dead solid perfect, with a nice exterior crust and moist within. Flavorful and moist with a light exterior crust. Tender as all get-out and really comforting. Mostly all good, though nothing in particular stood out and the falafel were cold and hard. I think they'd been sitting around a while. I'm not sure I'd go out of my way for this but if I were in the area looking for Persian, Kabobi would be near the top of my list. And it really was refreshing to be served kabobs that were cooked with some skill and care. That seems to be getting harder and harder to find as of late and I really appreciated it. I just made it here 2/14. Delightful stuff, that. I'd vote for them. I'm wondering if anyone has a take on a side-beside comparison of some of the Persian places in the area. For instance, I have familiarity with Noon O Kabab and is really where I head if I'm in the area (unless Mr Falafel gets me first). Is Kabobi a different level, a different experience? I usually do take out which mostly ends up in the corners of my car seats, but I find the quality of the meat at Noon to be very good. Our household is split on the two. I prefer Kabobi, by a hair. whocanitbenow wrote: Is Kabobi a different level, a different experience? Not in my book. Very good, especially, it seems, if you hit it at the right time. But it isn't on another level compared to other places in the category at their best times -- just right up there with them. rmtraut wrote: Our household is split on the two. I prefer Kabobi, by a hair. And I prefer Noon O Kabab . . . but not by that much, and I like them both quite a bit. 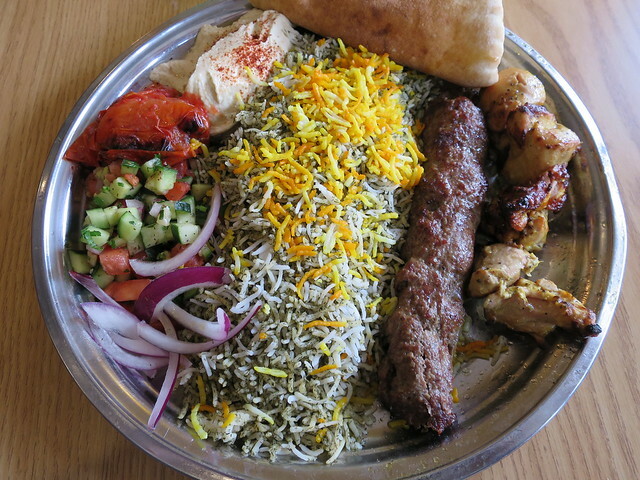 I finally hit Kabobi and thought it surpassed Noon o Kabab and Reza's (most recent visit was Oak Brook) by a handy margin in every category other than tablecloths. The touted tawook was flavorful and juicy as expected; the star protein was really the lamb koobideh, charred and moist and herbal, and actually held up as a leftover as well, which is not usually a thing for patties. The zereshk polo swapped in for the dill rice was a stunner, with frizzled onions and saffron and cranberries, and some actual tahdig / socarrat on the bottom. Cheerful family at the ordering counter and parties of every imaginable configuration smiling and laughing in a full dining room late. Question: what do you do with the butter pat? I didn't see anyone doing anything with it other than moving it over to the side, and the dishes are already saturated in butter and renderings. I'd love to see if this is a thing in Tehran but might not get the chance soon. The butter is meant to be mixed into or to top the rice, where it slowly melts and blesses the grains. Kabobi looks awesome; need to get there ASAP. I have been and like the food at Kabobi very much. The food is great but the both times ive been there they have been very stingy on the sauces even for dine in trying to charge extra for a single tahini and hot sauce which should be included with your meal. polster wrote: I have been and like the food at Kabobi very much. The food is great but the both times ive been there they have been very stingy on the sauces even for dine in trying to charge extra for a single tahini and hot sauce which should be included with your meal. Thanks to both you and Habibi for the data (love me some blessed grains). They may have changed sauce policies; this visit they were handing around bottles of both tahini and hot sauce for dine-in. My issue with Kabobi was related to the sauces as well. B/c they make a point of offering such a variety (as opposed to standard tahini+harissa for free, pay for garlic), I was willing to purchase 1 of each (mind you this was 12-15 mo's ago) and the portion was large. Problem was they all tasted the same! And bland while doing so. The texture was the same too. The owner was nice, and portions very good, but couldn't really get any edge flavor-wise. If they are able to satisfy the palates of others, I hope they prosper. Bigly. Been 3 or 4 times to Kabobi, solid to very good with one misstep to date. 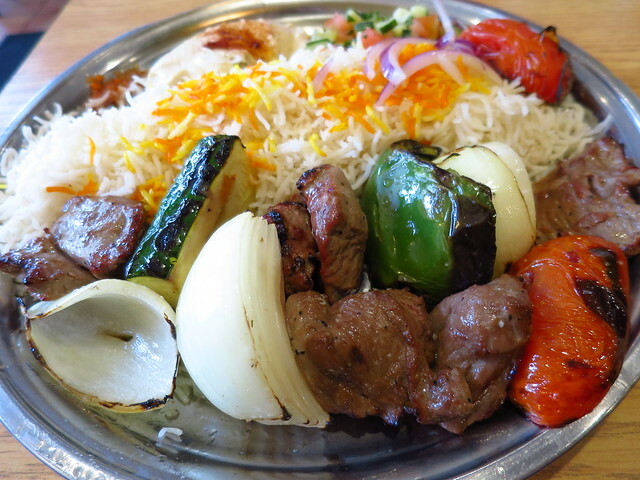 Very good kabobs, I particularly enjoy chicken koubideh (ground) kabob. Solid hummus, baba ganoush, salads and Persian rice. The one miss was chicken biryani on a lunch special. 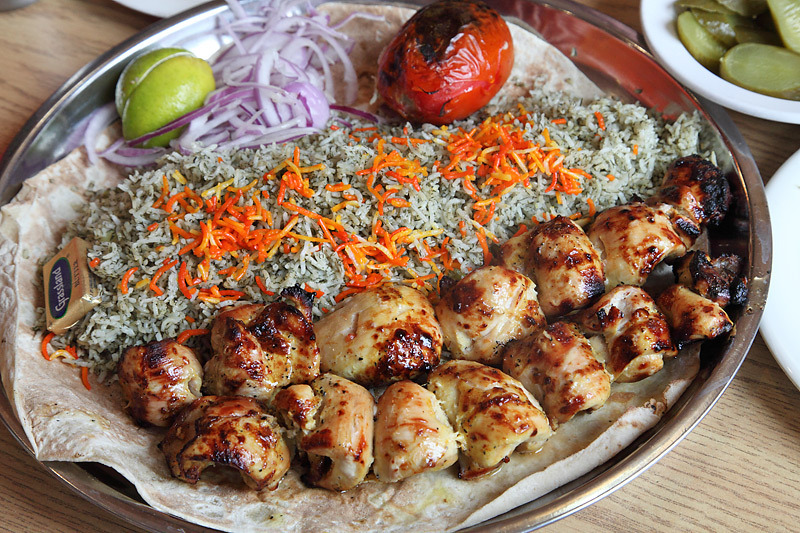 Terrific chicken koubideh (ground) kabob = lunch. Kabobi, count me a Fan! 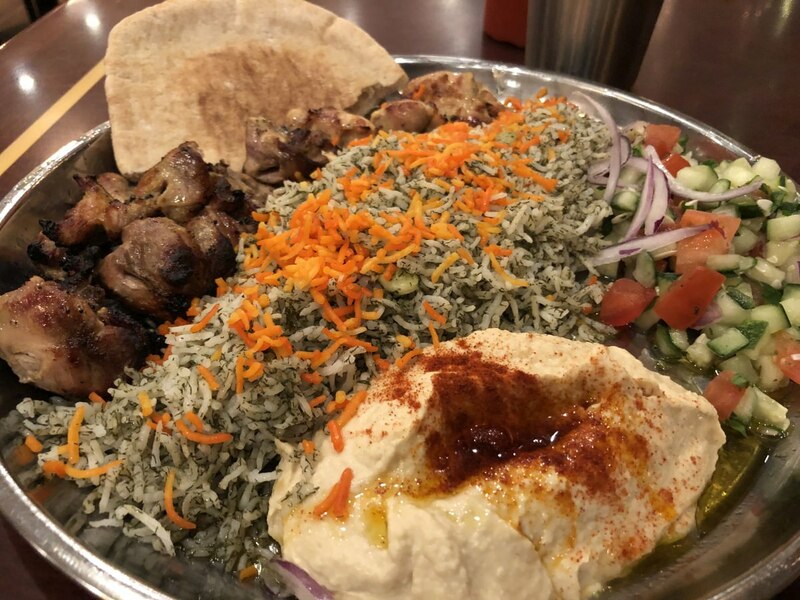 We had their humus with pita, tomato/cucumber salad, soltani beef kabob (kabob and koubideh) and chicken kabob (white meat) entrees, that come with massive pile of rice and grilled tomato. Beef was fine, chicken somewhat dry. Personally, I like it more gamey and juicy, but presentation was nice. Hot sauce was interesting. Wonder how shaslyk lovers compare it with Jibek Jolu. So happy to report that several visits (and delivery experiences) subsequent to the one about which I posted above have been stellar. In fact, it's remarkable how consistent the cooking of kabobs is here. They're always moist and juicy. And they're delicious. I especially love the koubideh but their tawook is exceptional, too . . . Hot sauce is plentiful. 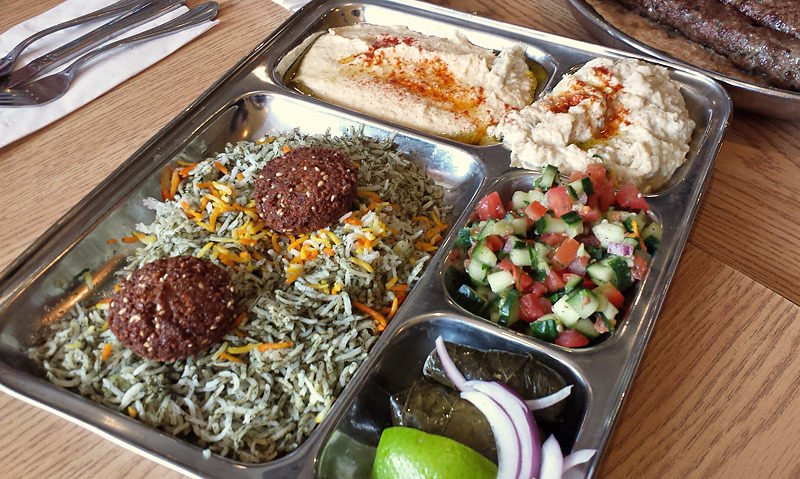 Hummus, dill rice and pickles are all great accompaniments, too. This is my go-to -- definitely a destination -- and it's been humming along for quite some time now. Agreed. This is my hubs’ and my favorite “new” place in eons. It’s exceptional—all of their rice sides are amazing and the grilled chicken thighs are superior to every other Mid East chicken dish I’ve had in Chi. And don’t miss the add on cilantro tahini sauce—yes, they charge for the “sauces”, but they are well worth it. I order a couple of them and thin them out with a bit of lemon or water and use for sauces for lots of other dishes I make during the week. Tried Kabobi for the first time tonight. Stranger to the genre having never been to Reza's, Noon-O, etc, but I really enjoyed everything. Ordered combo #1--shish tawook (chicken thigh) and beef koubideh (ground beef) and found them as juicy and well-prepped as others have described. Added a small cucumber salad and strongly tahini-inflected hummus as a $2 upsell and appreciated the hummus more than the entirely cromulent cuke salad. I "blessed" my rice as instructed upthread. Didn't notice a huge difference across a genuinely huge portion of half-plain, half-dill rice, but when in Rome. . .Is it lavash that lines the trays entrees are served on? 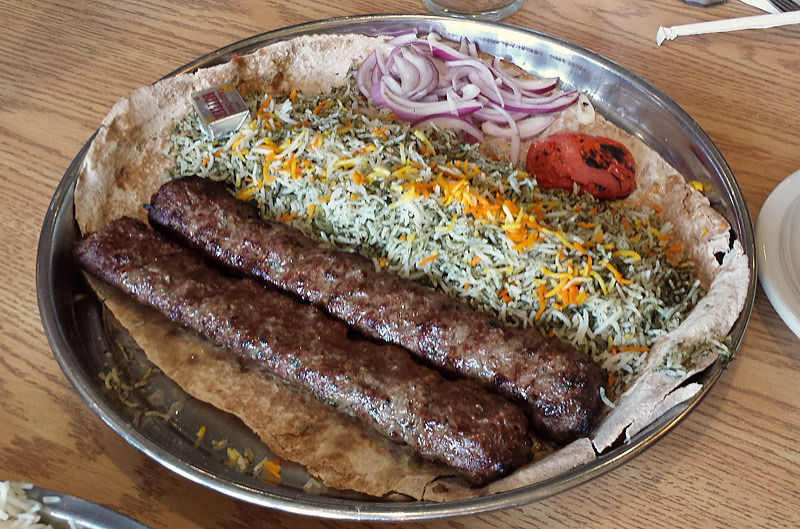 G Wiv wrote: Very good kabobs, I particularly enjoy chicken koubideh (ground) kabob. GNR nominee Kabobi for lunch, as above chicken koubideh stellar but the star of show was amazingly juicy perfectly grilled Sish (chicken thigh) tawook kabobs. Dug the fluffy flavorful rice with the odd little pack of butter melted on top, slightly prefer Kabobi's plain basmati rice to mixed with fresh dill. Fully endorse Kabobi for GNR. Chicken koubideh (ground) kabob w/plain basmati rice. It has been a little while since I have visited Kabobi. Unfortunately, what stands out to my recollection is rather lackluster prepackaged bread served with the kashke bademjan or soup and a firm refusal to give more than a single cup of tea unless I were to pay another two dollars (as I recollect) for another cup. Cyriaco wrote: It has been a little while since I have visited Kabobi. Unfortunately, what stands out to my recollection is rather lackluster prepackaged bread served with the kashke bademjan or soup and a firm refusal to give more than a single cup of tea unless I were to pay another two dollars (as I recollect) for another cup. It appears grilled ground meat is an exciting subject, especially accompanied by grilled tomato. People take pictures of it all the time. Bok Choy Jr wrote: Oui--and appetizing too! We too were served pastry and tea, gratis, at a recent lunch . . . and without us even asking for them. This place has become a regular staple in our monthly rotation. usually make it to Kabobi at least once every couple weeks. Took my parents there for the first time Saturday and they loved it. I never realized you could upgrade to fancy rice and I've been here about 25 times lol. Finally did that this weekend, got the rice with the carmelized onions, lentils and dates. Wow, it was so good, I'll be making that part of my regular order. One tip I have to give people who go here. You MUST get the cilantro tahini sauce. One of the best sauces I've ever had. Perfect for dipping Koubideh in. Words of praise for the $10-ish late night menu, balanced and fresh plates (order must be placed after 10 PM): this is a place where I look at the plate and think it's an honor to be eating what they're serving, like they're doing me some great and undue favor.